Sixteen years ago, I was somewhat fat phobic. The national recommendations were to get about 30% of your calories from fat so my target was 20%. I ate low fat/non fat everything and saved up my fat calories for cookies, chocolate and cake – things I believed needed fat to taste good. These days, I am more laid back with fat. I do watch calories, but I believe all the reports about healthful oils and try to incorporate them into my diet wherever I can. While I’ve changed a few steps (turbinado sugar, walnuts, order of ingredients), this recipe is a Pillsbury Bake-Off prize winner from 1990. I blame my fat phobic thinking back then for having missed it. At the time, I would have viewed this seemingly healthy recipe as useless because “3/4 cup oil” seemed like a lot for a wholesome cookie. At any rate, I’m glad this recipe hit the radar. These cookies are thick, crispy on the outside, kind of chewy on the inside, and full of flavor. They taste healthy, but in a good way. 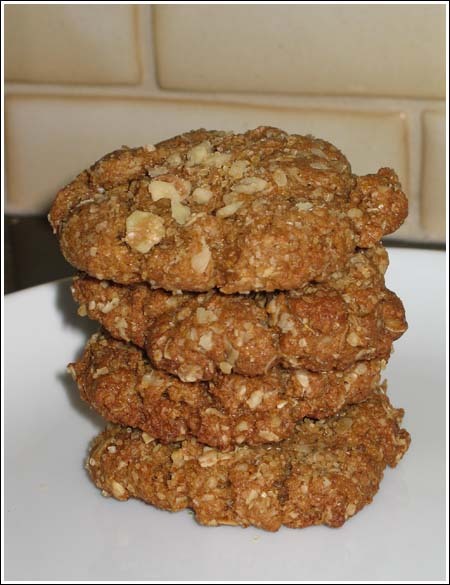 In a mixing bowl, thoroughly stir together flour, oats, oat bran, baking soda, salt, cinnamon, ginger and cloves. In a second mixing bowl, stir together sugar, oil, egg and molasses. Stir dry ingredients into wet ingredients and mix until thoroughly blended. Chill dough for 1 hour, covered. Preheat oven to 375 degrees F. Line two cookie sheets with parchment. Shape dough into 1 inch balls and place 12 balls on each cookie sheet. Press down with palm of hand to make half inch thick rounds. Sprinkle tops lightly with turbinado sugar or a mixture of turbinado sugar and walnuts. Bake for 7-10 minutes. I haphazardly use whatever baking sheet I happen to pull out at the time – but I always use my Silpat and never have a burned bottom. Does anybody else use a Silpat? It’s great that you post this recipe. I believe it does taste healthy, in a good way. And, yummy! I’ll try it this weekend. Have you tried the Pampered Chef Stoneware. Their bar pans and pizza stones work well for baking cookies. No burned bottoms! About a year ago, I switched to rimless baking sheets and haven’t had any problems with overbrowning. They aren’t Airbake, just plain ol’ baking sheets but there is a difference in browning between the rimless and the rimmed pans. Perhaps it’s not the Airbake itself but rather the rimless feature? tg, thanks! I like doing experiments. Maybe I’ll do more of them. Randi, good luck with the sour cream bars. Just use the recipe on Betty Crocker.com. Brenda and Claire, I am glad to hear you two validating my opinion on baking sheets. I’ve kind of taken my “perfectly un-burnt bottomed” cookies for granted until now. I like the rimmed aluminum cookie sheets for other things (granola, for instance) but my AirBakes have been great. Julie, I hate overly browned bottoms too and with the AirBakes, haven’t had to deal with them. Also, I’m glad to hear you can identify with me on the fat issue. It’s amazing how much my attitude has changed over the years. I honestly never thought I’d be drizzling olive oil over things. I also use European style butter. The funny thing is, it is so delicious and satisfying that you only need a very small bit. Thanks for talking about baking sheets! I HATE overly brown bottoms and even slightly over baked cookies. I want to get some for my holiday baking. I too, was fat phobic in the early 90s. Today, I would not touch a Snackwell! Calories are definitely the important thing, and I absolutely love olive oil and avocado. I even use butter with reckless abandon. Moderate amounts aren’t bad for you, and it is still my favorite thing on bread. These cookies look really good. I love whole wheat baking! I’ve already planned another cookie for today, but these are the next to make…maybe I’ll try them out on the family for Thanksgiving!!! I have a friend who swears by Air-Bake pans. I use pizza stones for mine, but I think that it has the same effect on the cookies (no burnt bottoms!). I do need to get at least one Air-Bake though. Can’t wait to try these cookies, they look great! I love my Airbakes too. I forbid my husband to touch them for any reason since he likes to carry things to the grill on cookie sheets–then cut the meat on it…grrrrrrrr! I was looking thru the betty crocker site for some recipes to use on a job I’m catering Nov 30th. I came across a bar cookie you submitted from 2005. I think I might make them for that event. Have you made them on this site? oh i just LOVE when you share empirical data like your comparison of cookies baked on regular pans vs. airbake. that stuff’s solid gold, sister!